It was “Take Me Out to the Ball Game” night last night, because the Princess’ middle school band was expected to attend the football game and participate in the Newman Smith Trojans’ halftime show experience. This of course took me away from where my heart was really located, as the St. Louis Cardinals took on the Chicago Cubs in their first ever playoff game. Seriously, the Cubbies have never taken on the Cards in the whole history of baseball playoffs because they are in the same division and the wild card format had never brought them into playoff conflict before now. Okay, before my brain bursts in cardinal red flames, the redbirds won and I only missed a fantastic playoff performance by pitcher John Lackey. The band thing simply had to take precedence. So, we went to Standridge Stadium to watch the football team from the high school where number one son did his four years. They were doomed from the outset. The one and four Trojans were facing the Woodrow Wilson Wildcats who had reversed the Trojans’ record, winning four and losing only one. The opening drive for a touchdown by the Wildcats let me know immediately that there would be no hope. And then the Trojan kick returner fumbled the kickoff that followed. It was going to be a long night in Trojan town. And yet, it wasn’t. 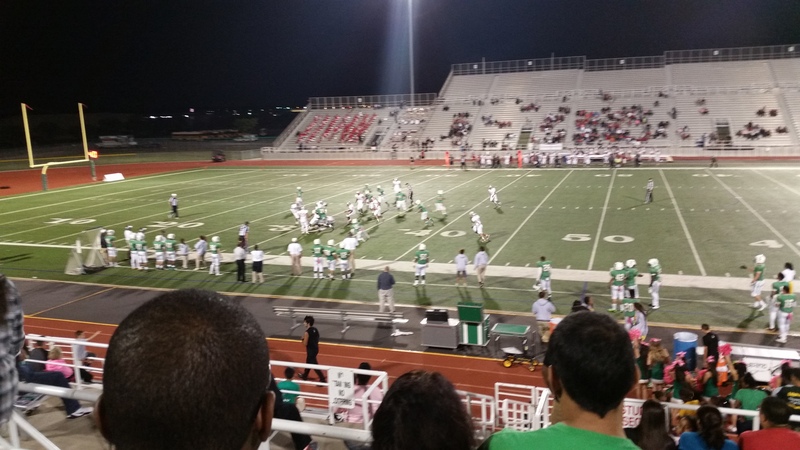 The boys in green were able to intercept a pass and run their way back down the field to tie the game up. It proved that the real way to win the game was for one side to be bright enough to never throw the dang ball. What happened next was a horrible mishmash of long runs and end-arounds punctuated by pass interceptions and penalties. At the half, the Trojans were behind 14 to 7. That brought us to the real event, the band performing at halftime. Number one son had always adored the band program at Newman Smith. Their marching band was award-winning and top-rated super-spiffy. Dorin, my number one son, worked hard for four years to help them stay a number one rated band while he was in high school. My daughter is seriously considering following in his footsteps. 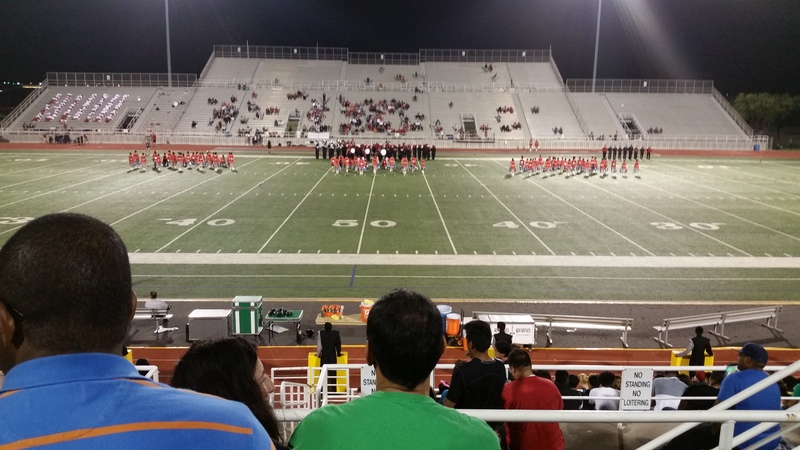 But the band competition between Woodrow and Newman Smith was far more lopsided than the football game. Only in our direction. You can kinda see in the picture how pitifully small and powerless their band really was. Of course, it didn’t help that they were facing away toward the visitor’s side, only showing us their little band butts during the entirety of their show. And you see how their little red ants on either side of the marching band outnumber them? Those little midget girls (apparently you made the girls’ dance team based on not being over four feet tall in high school) numbered about a hundred. And all they did was turn around in circles and wave little sticks with blue and silver Christmas-tree tinsel on the ends. 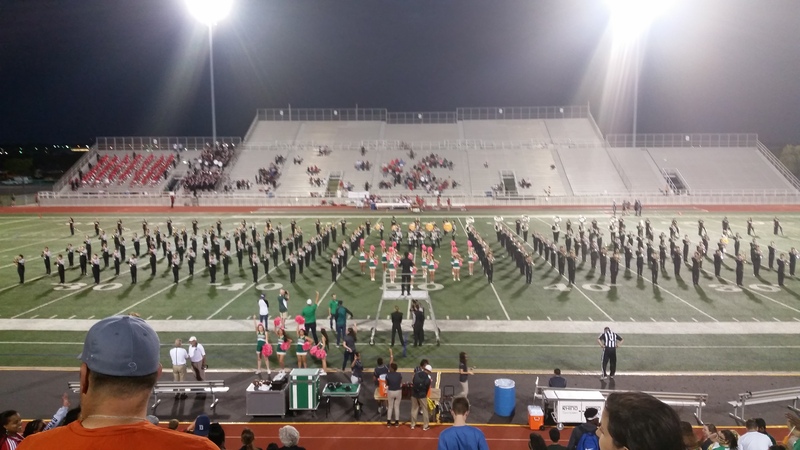 The band performed their UIL competition routine entitled “Elvis on Mars”, or “Sram no Sivle” as their signs read from our point of view. Their routine even included a boogie dance where the band put their horns and stuff down to wiggle their behinds at us. How is that marching? They weren’t even playing music at that point. So, we came to the performance of the Mighty Trojan Band, and the performances of “Main Street America” and “Maestro” seemed to be marching band times twelve by comparison. They actually marched in formation and impressed with a loud, bold, and highly musical sound. Their lines were crisp and their corners sharp and my wife and I really appreciated that they haven’t lost their edge even a little bit since Dorin played the mellophone among them. The marching band performance made the effort and expense worth it for the evening. We thoroughly enjoyed it. And then, like good band parents, we proceeded to go home after halftime. Football game? What about it? That’s not why we went there. Yet, the team had other ideas. They ran the second half kickoff three quarters of the way to the goal line. And they put on an unstoppable running game that took them down into the red zone. And as we were exiting, they scored the tying touchdown. “Do you want to stay and watch the game?” my wife asked with eyes that told me the answer had to be “no.” And I did not feel particularly well from sitting in the cold wind on metal stadium benches. So I let the aches and pains over-rule the game watching mania that nearly claimed me. We went home. I later learned that the Trojans lost in double overtime. Dang! But we won the battle of the bands hands down. I was in our high school marching band over 50 years ago, and we always divided our time facing home and away crowds at half time. In West Tennessee there were crowds! Football was a big deal. I don’t miss the frozen fingers and toes, but we had team spirit. I make fun of Woodrow Wilson’s band in this post, but I don’t mean to be mean. They were trying hard for a small marching band. They were playing hard to their own crowd, and didn’t think about the other side of the field. But the hundred midget girls waving tinsel on a stick… that was something special. You are a good dad. Note, when my eldest two played in the marching band, we enjoyed the songs they played in the stands more than the halftime performance, which got repetitive week after week. It is good to see the Cubs and Cardinals play in the playoffs. I remember the Ernie Banks and Bob Gibson games when both teams were good. The playoff will be good if the Cardinals win. After yesterday’s game, I begin to worry. The Cubs only seem to win when I don’t want them to.